"People always ask me, 'Were you funny as a child?' Well, no, I was an accountant." ~Ellen DeGeneres, host of The Ellen DeGeneres Show. Ellen DeGeneres is a stand-up comedian and the host of The Ellen DeGeneres Show. She also acts, writes (three books), and she produces. I'm thinking dancing should be in her credits too, because she dances so much on her show. She's won a bevy of awards--specifically, 13 Emmys and 14 People's Choice Awards. Personally, I think she's an underachiever. If you've ever seen her show, you'll know that Ellen is a delight. As I write, she is 57, being born in 1958. But she still acts like a child, so it's all good. 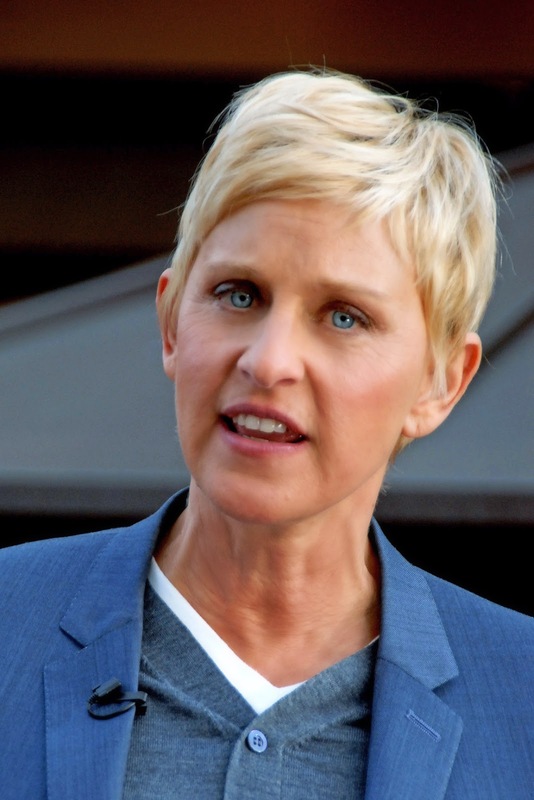 DeGeneres has hosted the Academy Awards (twice), the Grammy Awards (twice), and the Primetime Emmys (twice). She says she "most likely" won't host the Oscars again. Here are two clips. The first one is called "I Love Jesus but I Drink a Little," and it shows Ellen's gift for talking with strangers on her show. And here's a monologue from The Ellen DeGeneres Show entitled "Ellen's Got Your Coffee Questions Covered"
She has her own Wikipedia Page; and here are some books by and about her on Amazon; and some DVDs. Source Articles: Wikipedia: Ellen DeGeneres; YouTube; Brainy Quote; Selfies or Not, Ellen DeGeneres 'Most Likely' Won't Host the Oscars Again.